Whoo-hoo! Another Disney musical with mixed live action and animation! Rock on! Alright, so this really isn't my type of movie, but my wife loves them, and neither of us had seen this one before so we checked it out the other day. And I was shocked... not because I liked it, which I didn't, but because my wife didn't like it either. And you know if she didn't like it, there was NO hope for me! So now the question becomes... why? I'd say because the songs weren't very entertaining, and they went on FOREVER! Plus, there wasn't much of a story at all. I think they could have actually removed most of the songs and whittled this thing down to under an hour. Now, I didn't go into this film expecting to not like it. In fact, I was actually interested initially. The setting is in some small town somewhere outside of London during World War II. Three kids who were evacuated to this quaint little town, guarded only by a bunch of elderly soldiers, are sent to live with a woman Eglantine Price, who is none too happy to receive the children... and they are none too happy to be there as well. 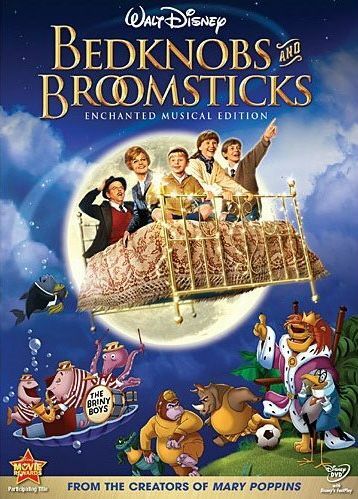 So that night, the three kids sneak out the window, intending to head back to London, when up in the sky they see none other than Ms. Price riding on a broomstick! Yep, Ms. Price is a witch. Or technically, an apprentice witch, as she's still taking the mail-order witch course. Charlie, the eldest of the kids, decides to use this information to their advantage and attempts to blackmail Ms. Price. After a bit of back and forth, it is finally decided that she will give them a spell, and casts a traveling spell on a bedknob that the youngest kid, Paul, stole off their bed. Now, with that bedknob, the bed can travel anywhere Paul tells it to. So far, so good. I'm interested to see where it's going, and then it hits us with a song. I don't even remember what it sounded like, but I do remember wishing it would end. And off they go! Their destination is London, more specifically a one Professor Emelius Browne who runs the college of witchcraft that Ms. Price has been doing through the mail. Before they left, Ms. Price had received a letter saying the college was shutting down, but she is desperate for the next lesson, a substitutiary locomotion spell that basically gives life to inanimate objects. So she tracks down Mr. Browne who turns out to be nothing more than a typical magician with trick props who just happened to have a real magic book, though none of the spells ever worked for him. Here we have a long and annoying song, then learn that he unfortunately has only the first half of the book, and the rest of the lesson Ms. Price desires is in the second half. I'm still hanging on to wanting to see what's gonna happen, but I'm no longer enthusiastic about it. Anyway, Mr. Browne suggests they will probably find it in the market on Portobello Road, so they all head there with the bed and almost instantly find themself in another song, this one REALLY long, and it gets tired very quickly. And after it finally ends, they're still no closer to finding the book. But then they're stuck up by some criminal who takes them to some guy called the Bookmaster who has the other half of the book. Alright, so they put the book together and learn that the incantation is... not in the book! It's on a medallion that the wizard who wrote the book used to wear. But the wizard did something which gave his animal human qualities, and they killed him or something and now can be found in a storybook. So off they go into the storybook! First they have a song where they are on the bed under the sea, and after that they watch a wacky soccer game being played. Finally, they steal the medallion and bring it back to the real world... except that it doesn't make the trip and just disappears. That's a nice lesson to teach kids, by the way... it's okay to steal if you want something. Why couldn't they just look at the medallion and memorize the five words? Why'd they have to steal it? Anyway, by this point I just can't wait for the film to end. Unfortunately, it keeps going with some German invasion that Ms. Price has to help repel with magic involving a bunch of inanimate objects moving on their own. It's funny in that you can see all the wires used to make the things move. I forgot to mention that earlier, but you also see the wires used to float Ms. Price in the air at the beginning, and then again to float the people in the water. Basically, anytime anyone floats, you can see wires. As with just about all the recent Disney DVD release, there are some decent extras, though I was really expecting a bit more than what's here. There is a deleted song called "A Step In The Right Direction", plus the Sherman Brothers talking about some of the music. I didn't watch the Portobello Road recording session as I did not want to hear that song again. It's too bad, because if it was just way shorter and ditched the animated section it probably would have been pretty decent. Oh well.